Hot Melt Amorphous Polyalphaolefin (APAO) Market size was estimated over USD 200 million in 2016 and is expected to grow by a CAGR of more than 6%. Amorphous polyalphaolefin, synthesized by polymerization of alpha-olefins such as 1-butene or propylene, is extensively used in the production of hot melt adhesives. High growth in the global packaging industry will drive the hot melt APAO market in the coming years. Increasing purchasing power of the dual income families and shifting focus towards packaged products delivered at doorstep has resulted in high demand for packaging materials from the food & beverage, pharmaceutical, and e-commerce industries. Global market for adhesives used in packaging was valued at more than USD 15 billion in 2016. Converting industries growth will also boost the hot melt APAO market in the coming years owing to extensive usage of adhesives in this industry. Growing popularity and demand for lightweight and low emission automobiles is expected to positively influence the global hot melt APAO market. Structural adhesives play a significant role in weight reduction as well as emission lowering strategies of automobile manufacturers. These adhesives are used to bond different materials used in automobile assembly and helps in increasing rigidity and stiffness of the vehicle without any substantial increase in its mass. Lighter weight vehicle needs less fuel to run which will lead to lower emission levels. Increasing personal car demand along with the rising awareness about fuel economy will, thus, signify the overall hot melt APAO market in the forecast spell. Global hot melt APAO market may be hampered during the forecast timeframe due to volatile raw material prices. As both raw materials used in the synthesis of the product, alpha-olefins and 1-butene or propylene, are petrochemicals, any change in crude oil price will directly affect their prices as well. Crude oil prices fluctuated from 102.52 USD/barrel in 2012 to 37.34 USD/barrel in 2015 and again to 51 USD/barrel in 2016. This fluctuating nature will likely continue in the future and is expected to hamper the hot melt APAO market in coming years. By product, hot melt APAO market is categorized into two segments viz. homopolymers and copolymers. 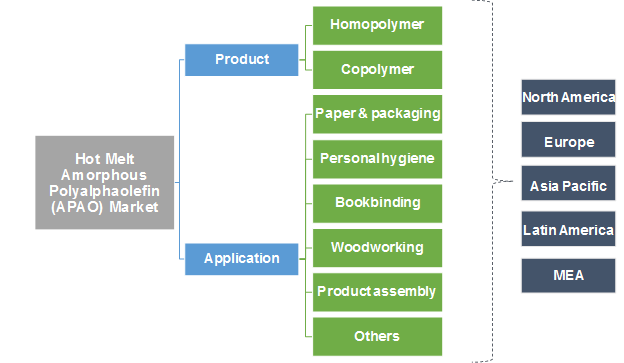 Copolymers have a significant share in hot melt APAO market owing to its many properties such as better impact strength, durability, and toughness. Although it is softer than homopolymers, it has better resistance to stress cracks and toughness in low temperatures. Homopolymers are characterized by high strength to weight ratio and has better stiffness, weldability, and chemical resistance and are extensively used in corrosion resistant structures. This segment will likely grow at a CAGR of more than 6% during the forecast timeframe. Global hot melt APAO market is categorized into six segments as per its application. These include paper & packaging, bookbinding, personal hygiene, product assembly, woodworking, and other applications, including, automotive assembly, textiles, plastics, etc. Paper & packaging application segment has more than a third share of the overall hot melt APAO market owing to the wide-ranging use of the product in this industry. This share is expected to increase at a healthy rate during the forecast timeframe. 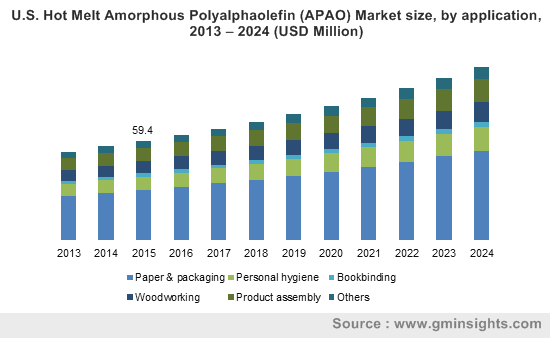 Personal hygiene application segment also has a substantial share of the hot melt APAO market and it is poised to increase at a fast pace due to growing awareness and demand for personal hygiene products such as diapers, feminine hygiene products, etc. in the developing and underdeveloped countries. This segment generated revenue more than USD 30 million for the hot melt APAO market in 2016. North America and Europe has a substantial share of the global hot melt APAO market owing to the developed packaging industry in those regions and increasing demand for packaged food products. Increased penetration of e-commerce in North America and Europe has also resulted in a high demand for hot melt adhesives needed for packaging. Awareness about personal hygiene products is also more in these regions creating a stable demand for these products. In 2016, North America and Europe together registered a revenue more than USD 120 million. Asia Pacific share of the global hot melt APAO market is poised to grow at a CAGR close to 7% during the forecast timeframe. This can be attributed to improving economic condition of the region which has fueled a demand for packaged products. Increasing demand for personal hygiene products will also influence the hot melt APAO market in this region positively. Shifting of manufacturing bases to developing countries like China and India will also play a significant role in the growth of amorphous polyalphaolefin demand in the coming years. Global hot melt APAO market is characterized by the presence of several large multinational companies such as Henkel AG & Company, Evonik Industries, Arkema, Eastman Chemical Company, Huntsman Corporation, H.B. Fuller, and REXtac. Other important players in hot melt APAO market include Liaoyang Liaohua Qida Chemicals Company, Evans Adhesive Corporation, Guangdong Orient Resin Company, Glue Machinery Corporation, Texyear Industrial Adhesives, Bond Tech Industries, Almas Fanavaran Giti Company, and Adtek Malaysia Sdn. Bhd. Many manufacturers in the hot melt APAO market are focusing on developing new and innovative amorphous polyalphaolefin products to gain a competitive edge against other industry participants. For example, Evonik Industries launched a new product named Vestoplast W-1750 which has low viscosity and high shear stability and can be extensively used in carpet manufacturing. Hot melt adhesives have gained prominence due to their many advantages such as quick setting, resistance to moisture, humidity or other environmental conditions, easy usability, etc. Traditionally, a-tactic polypropylene (APP) were used as a primary polymer in the hot melt industry but due to shortages of APP, amorphous poly-olefins and amorphous polyalphaolefins have become the major polymers used. Amorphous polyalphaolefins has many benefits over other substances such as better adhesion and cohesion, improved bonding with substrates, applicability by various processes such as spraying, roll coating, extrusion, pumping, etc. These properties will likely increase the products demand in hot melt industry and propel the global hot melt APAO market in the future.